Hi guys, how's your weekend going? I hate how fast mine has flown by. Too many errands to run and Father's Day shopping all weekend long, my head is still spinning. I was supposed to have this up yesterday but with so much going on I didn't have the time. I'm starting to think I may need to pull an all nighter to catch up on all my things, haha. If you have never stayed up 24 hours, I definitely recommend you don't do it. Sure it may seem like a good idea but trust me your body will hate you for it. 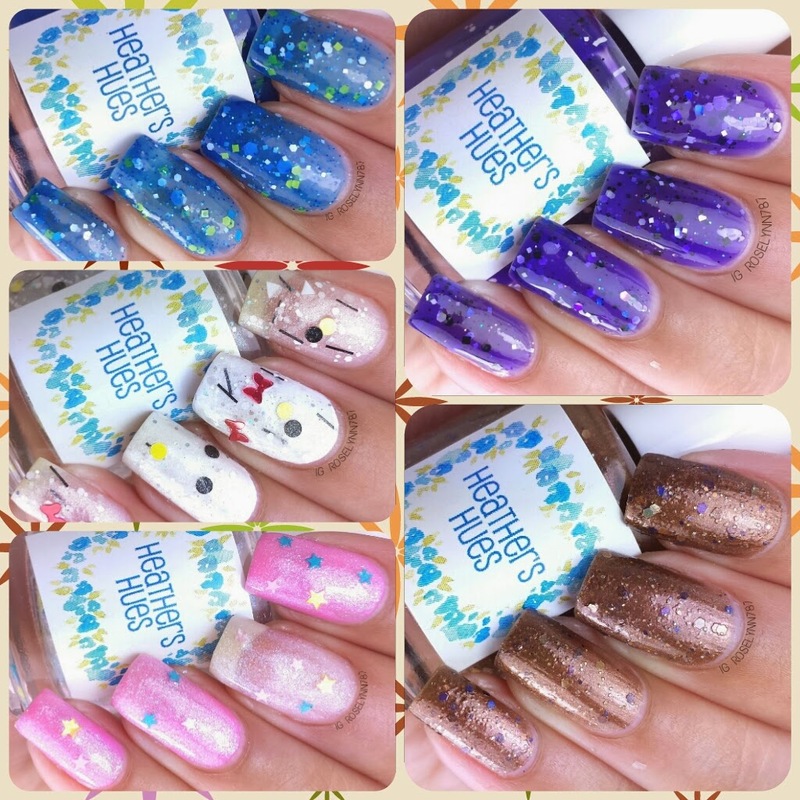 Today I have the 2nd half of Heather's Hues Hello Kitty and Friends Collection. In this post, you'll be see the remaining five polishes that are made of cuteness supreme. Please note, all polishes have been pre-conditioned and left upside down a full 24-hours before use. 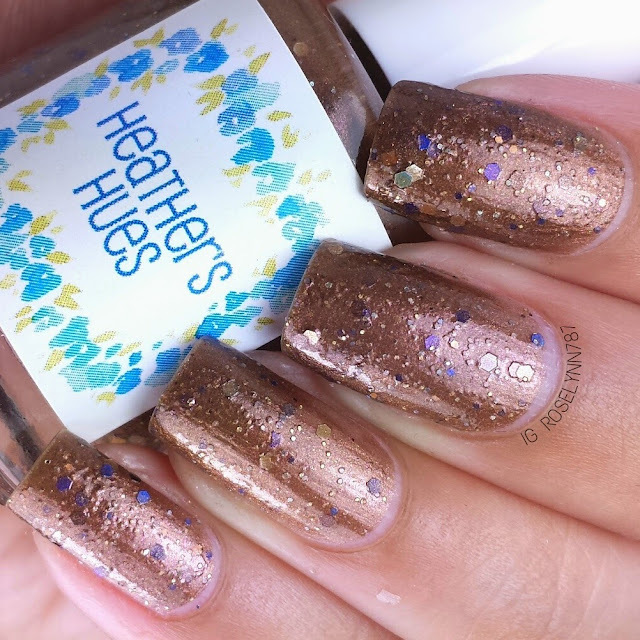 Warm (Cocoa) Kitty is a metallic brown shimmer polish filled with micro flakes and gold, blue, and silver glitters. Starting off the second half of this collection is this beautiful and unique brown polish. I don't know why it's so uncommon to find brown polishes, but this one proves why we need them. 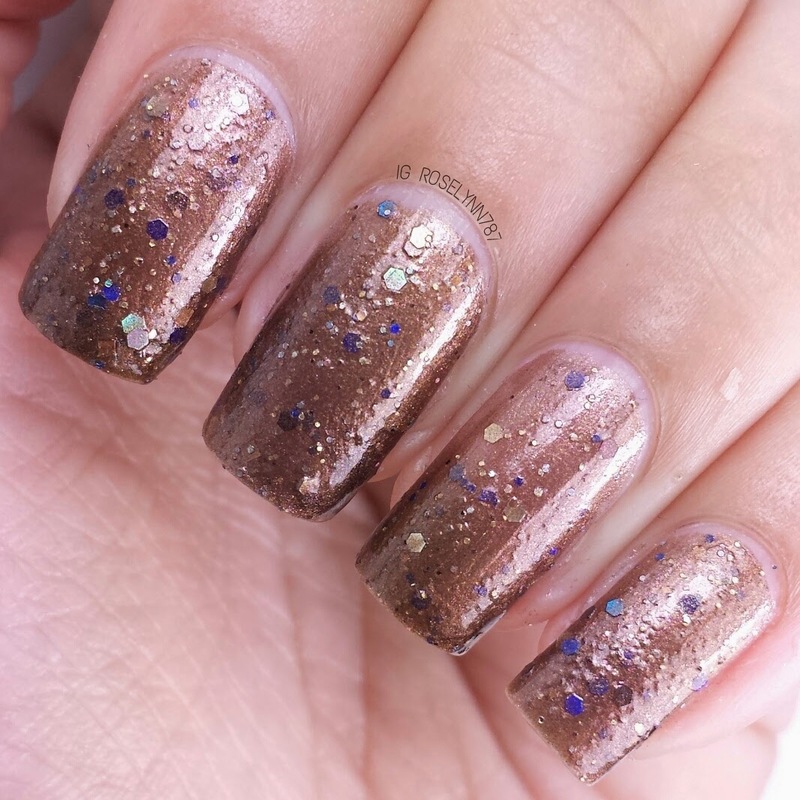 It is absolutely jam-packed with glitters, making it almost appear like a texture polish. The one thing I do have to say though, it's not really summer friendly. It's definitely more appropriate for the fall. Swatched over a clear base, used two thin coats, and sealed with a fast drying topcoat. The formula is pretty good, I did not have any problems with the glitters. You'll find this to be sheer in a single coat but only needs two coats for full opacity. 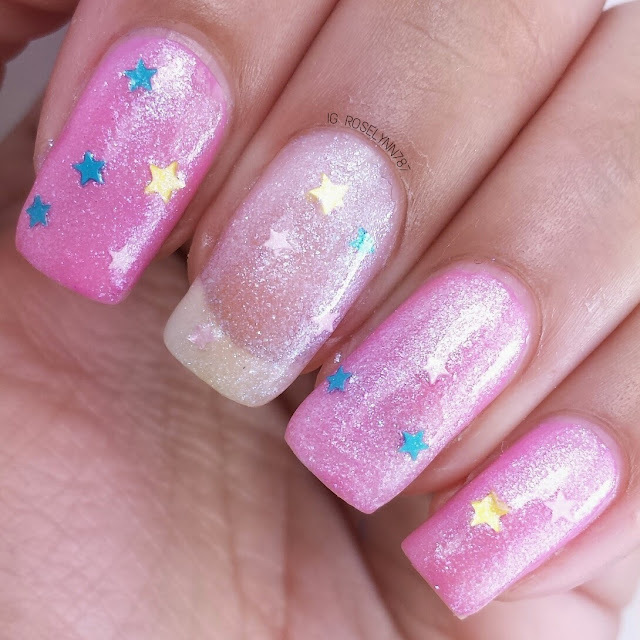 Make sure to add a topcoat to smooth down all the glitters and brush strokes. 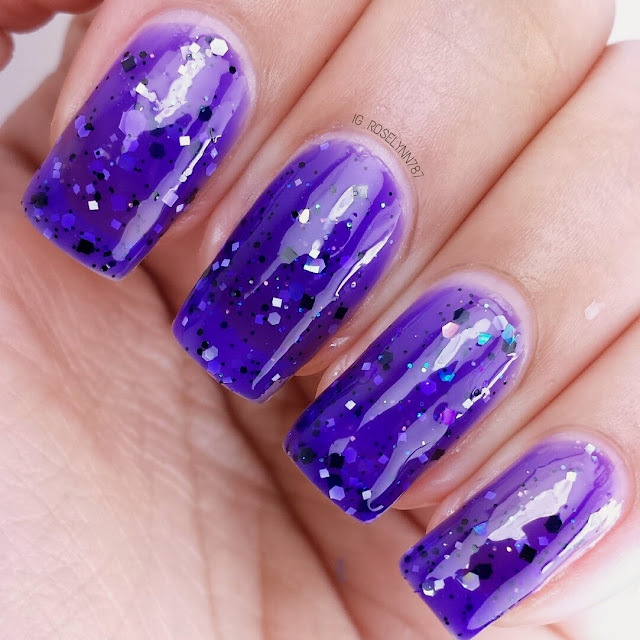 Playful Pup is a bright purple jelly polish filled with black and white glitters in various sizes. This is definitely one of my favorites in this half of the collection. I love the strong, almost neon, shade of purple. Perfect for summer. The color is a lot brighter than these photos show, more-so in natural lighting. Swatched over a clear base coat, used three thin coats, and sealed with a fast drying topcoat. Unfortunately, this beauty did stain my natural nails a bit. As I mentioned in the other half of the review, I'm not bothered by stains but I know you guys might not feel that way. Because this is a jelly polish, you'll have to layer at least three times to achieve a good opacity level. Besides the bit of staining, the formula is easy to work with. 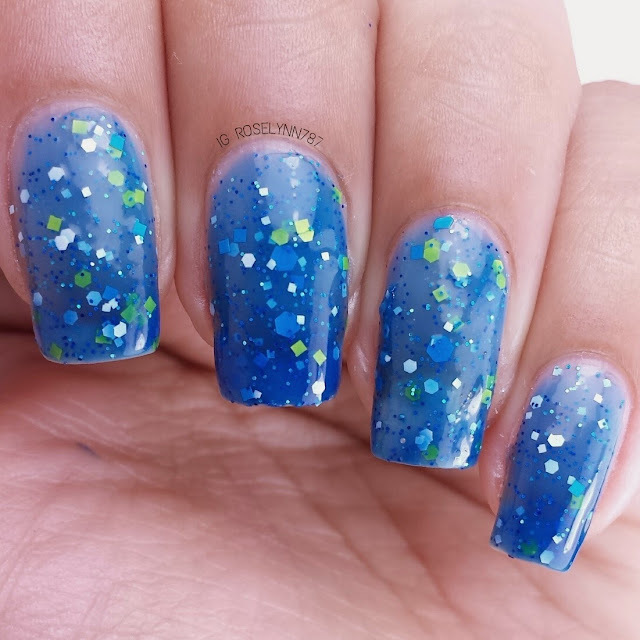 No clumping and no having to fish for glitters. 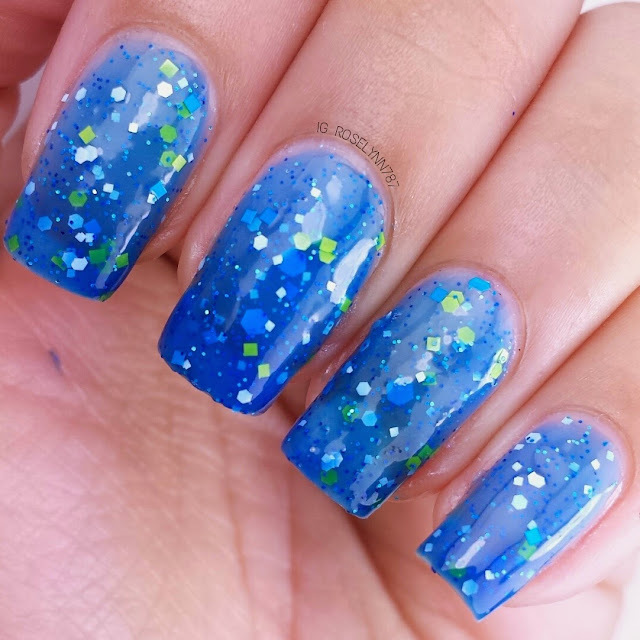 Proper Penguin is a cute thermal jelly polish that shifts from dark blue in a cold state to a bright blue when warm. This polish is also jam-packed with neon yellow, electric blue, and white glitters. I LOVE thermals in the summer time and the color selection for this beauty is just perfect for the occasion. 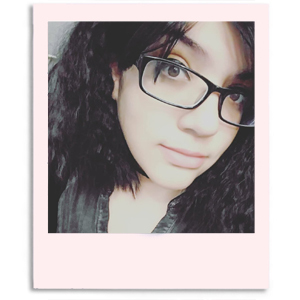 All photos are shown in mid-transition, which is absolutely gorgeous. I may or may not have found myself playing with water for at least an hour after I took these photo, haha. As much as I like some of the other shades, I'm going to have to call this one the must-have in this collection. Swatched over clear base coat, used three coats, and no topcoat was used. Formula for this beauty was excellent, one of the better ones in this half. No problems with the application and no having to fish for glitters. The thermal transition is immediate and gave me no trouble either. Despite the bright color, don't worry, there is no staining with this polish. 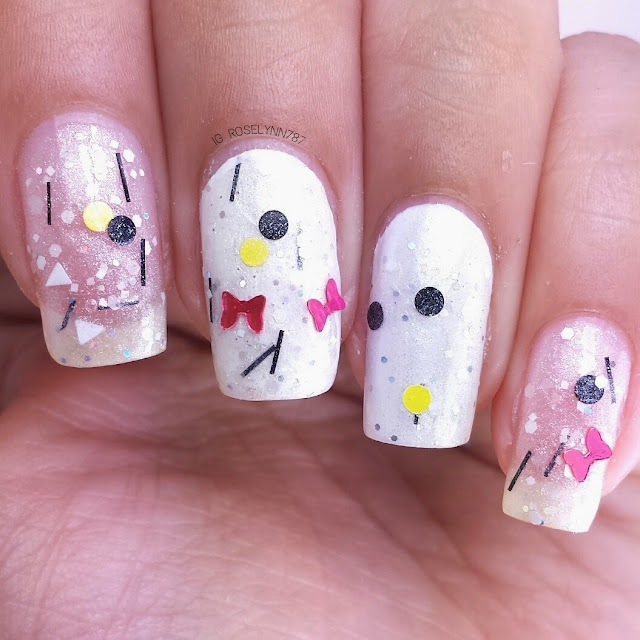 Soft Kitty is a glitter topper with a slight shimmery base color and is filled with white triangles, black dots, black bars, and yellow dot glitters. Optional are the red bows, they can either be mixed into the polish or be purchased on the side. Finally, we have Hello Kitty herself! I love how many different types of glitters are included in this polish. 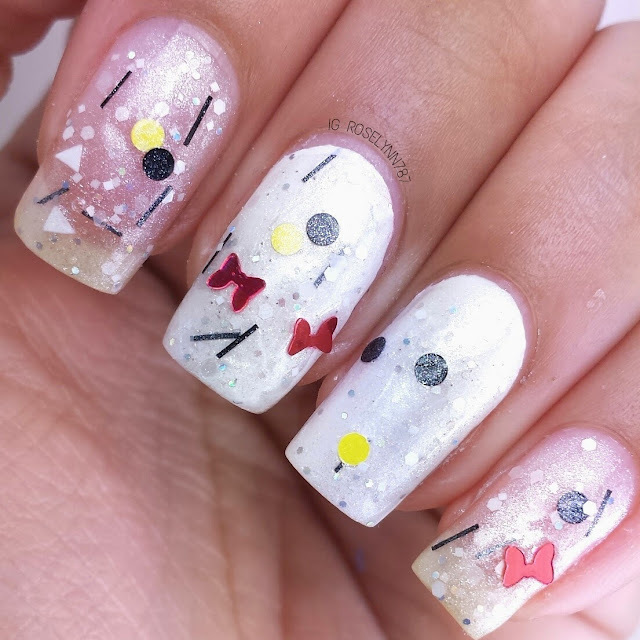 Heck if you do a little placement you could make her face on your nails. I should of tried that! Instant regret, haha. 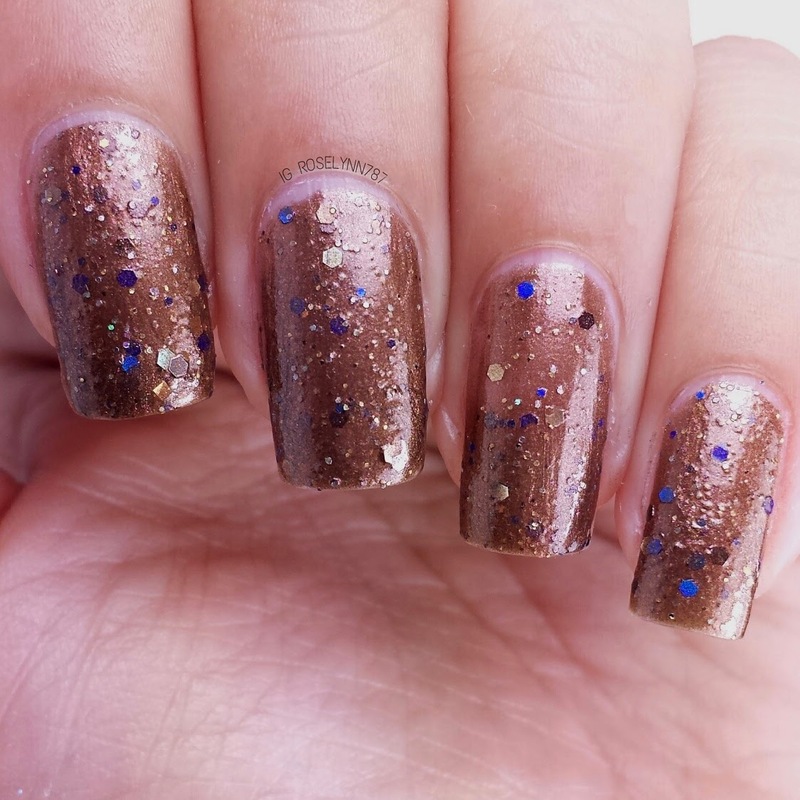 This polish is definitely for those who love glitters immensely. I selected to have the red bows added on the side and not directly into the polish. 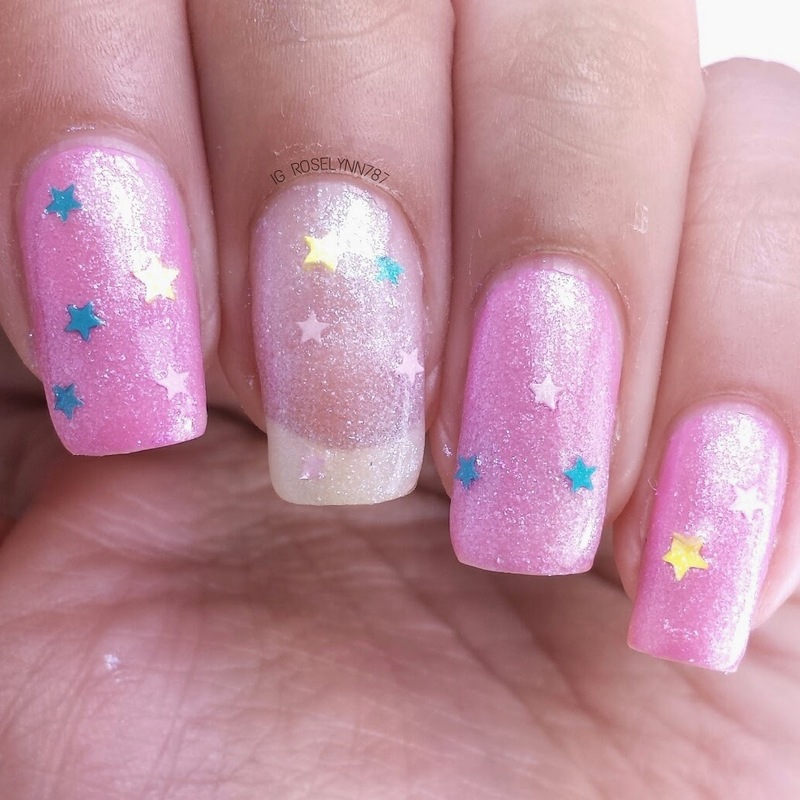 Swatched on my middle two nails over a white base color. My index finger and pinky are swatched over just a clear base coat. I used about three coats applied using the dabbing method and sealed with a fast-drying topcoat. Besides the placement used for the red bows, all other glitters were applied as they came out. I did find myself having to fish out for the yellow dots only. It didn't give me too much trouble but was an effort for sure. 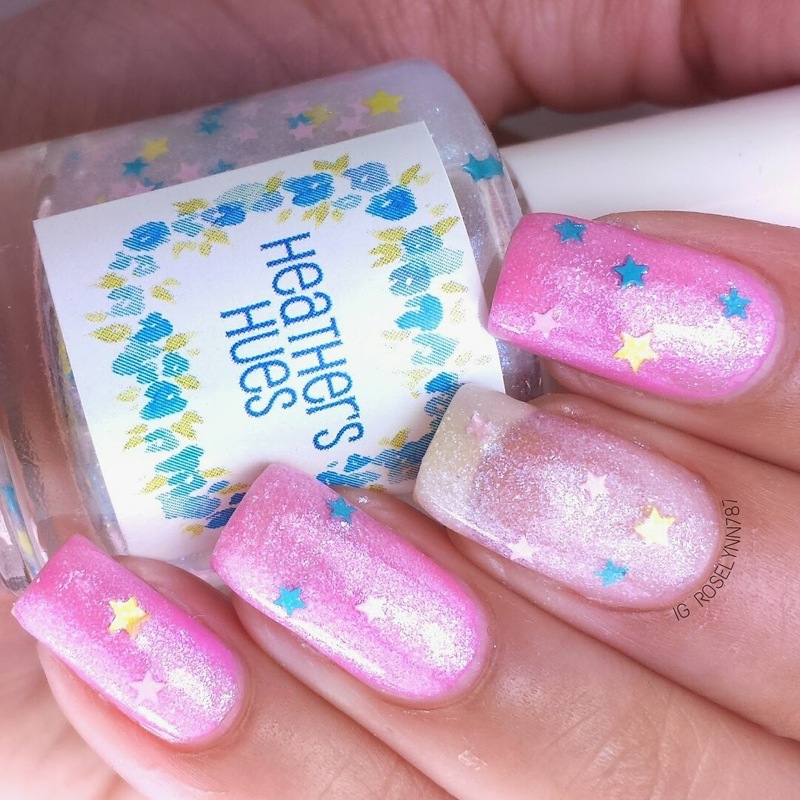 Twin-kling Little Stars is a translucent white with blue and green shimmer polish filled with blue, yellow, and pink star-shaped glitters. Doesn't this polish make you feel all warm and fuzzy on the inside? I don't know. there's just something about this cutie that makes me feel so girly and child-like. I love how it looks over this base so it's my suggestion to use a pink shade for the undie. Swatched over a clear base coat on my middle nail and all other nails were swatched over Orly It's Not Me, It's You. My only concern when it comes to this polish is the glitter fishing. It required the most effort out of all of them in this collection. All glitters in these swatch photos were done with placement and dabbing with three thin coats. Because of all the layering, a fast-drying topcoat is a must. Overall I enjoyed this half of the collection just as much as the first half if not more. There is a lot of variation in finishes and colors, which gives it a little something for everyone to enjoy. The only negatives I have are the glitter fishing for some of the more heavier glitter based polishes and the bit of staining I experienced. As I mentioned in the other half, these problems were addressed with Heather who has taken measures to correcting them. The batch used for these swatches was a very early testing one and not the one used for release. However, negatives aside this collection does have some very beautiful shades and glitter combinations that should not be missed out on. 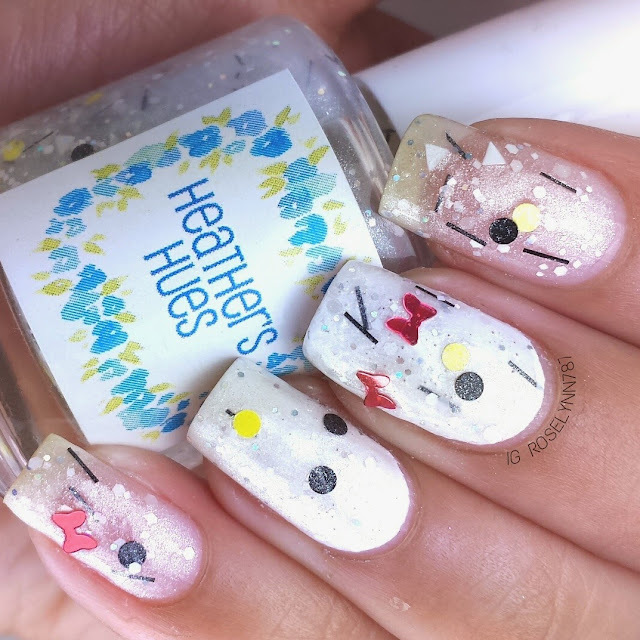 The Hello Kitty and Friends Collection by Heather's Hues is now available for purchase!